The Morgan Horse is the first documented American breed, and began with a stallion by the name of Justin Morgan. Foaled at Randolph, Vermont in 1789, he was originally name Figure, but was given his owner's name (a teacher and music composer named Justin Morgan) after his owner passed away. His new owner, Robert Evans, discovered that this little horse at only 14 hands could out-run and out-haul all challengers. Because of this ability, Justin Morgan was used for hauling freight and plowing, clearing logs, and all kinds of draft work. Justin Morgan competed throughout his life in every kind of racing and hauling contest. He was never beaten. This wonderful horse died in 1821 when he ws 32 years old, from an untreated kick received from another horse. All modern day Morgan's are traced to Justin Morgan's most famous three sons, Sherman, Woodbury,and Bullrush. Justin Morgan himself, was probably a combination of a Welsh Cob, and possibly a thoroughbred. 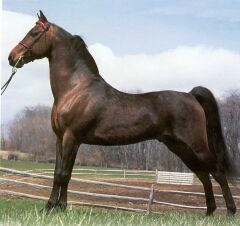 The American Saddlebred and Standardbred, and the Tennessee Walking Horse, all have some Morgan blood in their lines. The Morgan is used in both ridden and harness classes, and pleasure riding too. At one time, the Morgan was the official horse of the United States Army. Read the next horse breeds article on Palomino Horse.